I would like to express my interest in serving as a Board Member for the League of Professional System Administrators. I understand the commitment involves attending a bi-weekly meeting as well as a mandatory in person meeting annually. I am aware there are at least 10 committees that I may also be asked to assist with in one shape or form. I will bring to the table 15 years of technical and managerial experience to the board. My experience includes positions of VP of Information Technology, Director of IT, Systems Administrator, and Help Desk Supervisor as well as my very first IT job as Technical Support. My passion for the information technology field, proven skills and diversified experience will enable me to contribute to this organization. 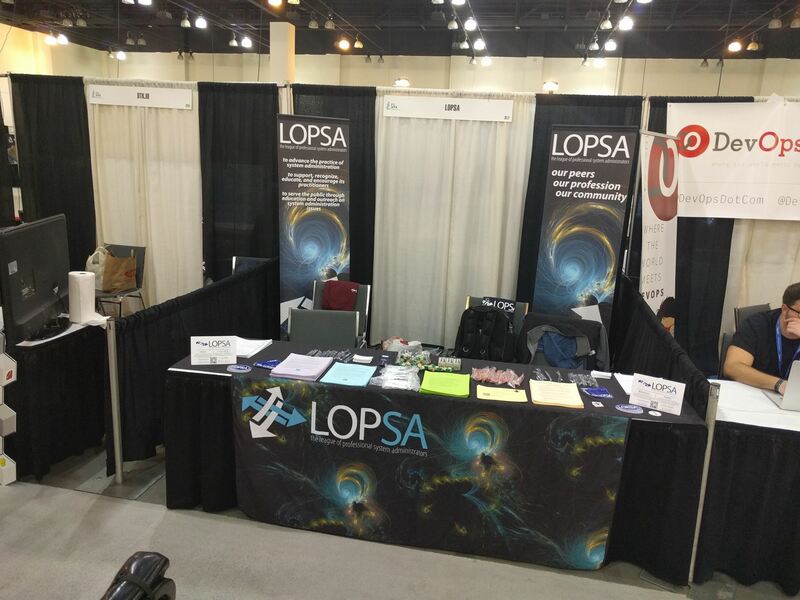 SCALE 14x is in full swing and LOPSA is at booth 317 in the exhibition hall. If you are in the area, stop on by to learn the latest about LOPSA. Thanks to many people, LOPSA's 10th Anniversary and After Dark party were a big success. Many thanks to Jennifer Ash-Poole for picking up the wonderful cake and providing all the silverware; to Qumulo for sponsoring the first round of drinks; to the Wardman Park Marriott Hotel for all their help; and to all the members who came to the party. LOPSA Mentorship Protege gets Certified. Ski presents the 2015 Yerkes Award to Jaime Riedesel. https certificate: I found out after the site went live that this would be a problem as the vendor must update the certificate. I am working through the vendors process for this and hope to have it fixed within the week. $10 membership discount: I found out today that the discount functionality only applies to new accounts, not to renewals (of the most requested enhancements requested according to the vendor). i have changed the default payment to $40. Anyone who paid $50, please contact board@lopsa.org or swing by our table for a refund. Limerick contest: Several folks pointed out to me that the poem i have on the website does not meet the standard of a Limerick. Missed renewals: A few people renewed before the website went live and their renewal did not make it into the new system. I should have these cleaned up by the end of the week. Please email custserv@lopsa.org if this happened to you. Profile issues: A few people found issues in their profile due to problems in the data migration. Please check your profile to make sure it works for you. Bad links: Please keep letting us know about them. We are fixing them as we find them. Each presentation is only entitled to a single discount so if there are multiple presenters you will need to determine how you’d like to split this. Please see our website at www.lopsa-east.org/ for more information on LOPSA-East ’16. If you still have additional questions, we can be reached via submissions2016@lopsaeast.org. In addtion, Qumulo will be hosting a special drawing at the After Dark Party for an Apple TV. The LOPSA board welcomes our newest sponsor Edgestream Partners to the LOPSA community. Edgestream Partners is a small group of scientists and engineers with a unique approach to trading in the financial markets. They design, build and run a global trading software platform. They take pride in their software craftsmanship and use Python, Cython and C on Linux to run their global trading operations. They also use open-source tools as much as possible such as Python, PostgreSQL, numpy, git, Cobbler, Puppet and Ansible. Tools that LOPSA members use and have contributed to over the years. LOPSA's Seattle chapter meetings came in at number #7 and the LOPSA Cascadia IT Conference clocked in at number 20. Congratulations to the folks in Seattle to get listed. There are also many other events that may interested you on the list.